Since now I'm in the mood to look at mean-looking Detroit beaters, I'm breaking out some shots I took while enjoying a burritos-and-beer repast in the Oakland Coliseum BART parking lot prior to a baseball game. Apologies for the fuzztastic quality of my low-end cellphone camera, though I do think the grainy pixelated look does a good job of capturing the spirit of this fine automobile. If you're going to leave your car parked all day in one of the toughest neighborhoods in East Oakland, it's a good idea to select a nothing-to-lose beater for your ride. Actually, this Newport looks great like this. No rat-rod pretensions here! The Newport for 1964 came standard with a 265-horse 361 engine, though you could get one with the optional 360-horse 413. Best of all, you could get a floor-shifted 4-speed as a factory option in this car, with a price of only $227? Jeez, why didn't everyone get the 4-speed? This tire wins the Best Tire Name Ever award. Grand Turbo! If I ever get a Starion, it's gonna have a full set of Grand Turbos, I tell you what! Note the innovative rear window treatment. Probably fine at any speed under 50. Is that a Prius in the next space? 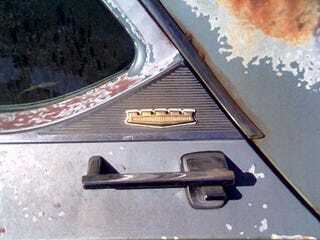 Here's another example of Calilfornia body rust; it took 43 years to get like this. Probably some rust-through around the rear window frame, and therefore some rust-through in the trunk. It's a slow-motion process out here, though. I'm going to go out on a limb and say this car looks even meaner than Alameda's '62 New Yorker. I'd definitely like to see the two of them race, though the New Yorker probably has the edge in engine power. The base price of this car was $2901, $125 more than a V8-equipped Galaxie 500 that year. That's a tough choice, especially considering you could get the Galaxie with a 4-speed as well. Amazingly, this car still has intact taillights! Judging by the thousands of dents and dings, I'm assuming this car spent a good portion of its life living across the Bay in San Francisco; cars sort of erode away over there.